This month My Scrapbooking Supplies is the sponsor at the Critter Challenge Blog. When you play along with the challenges and link in at the Critter Challenge Blog, you're name will be placed in the random prize drawing. When you play along each week, you'll increase your chances of winning! You can incorporate any other colors, just make sure these colors are your focal colors. Remember you can use any vendors stamps, so why not play along! From this color pallette, I used Stampin' Up! Eggplant card stock, and a piece of pattern paper from Basic Grey Two Scoops. 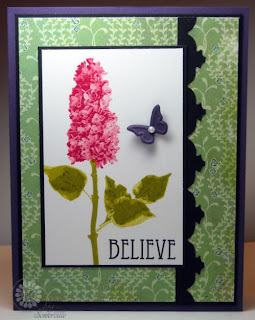 The Rose color is in my beautiful Multi Step Lilac image from Kitchen Sink Stamps. The sentiment is from Vintage Words. The Black was cut using the Ornate Alterations Die from Tim Holtz. Looking for more inspiration using this weeks challenge, head over to the Critter Challenge Blog to see what the other Team Members created this week. Beautiful card with these great colors, Lisa!! I love your stunning lilac and that sensational punch!! Outstanding design! This is just sooo bautiful, Lisa! You rocked these colors!! Love the border with the added butterfly!! Beautiful card, love the TH die, I need to use mine more often, love what you did with it! Beautiful card and colors. Luv how you used the die! So pretty!! The colors are so beautiful with the Lilac set! Awesome border design, too!! Pretty card and gorgeous stamping as usual. Love the colors and how you used them! Beautiful!